Why Va Poison Ivy Removal? We have superior knowledge and experience. We are dedicated and professional. We are fascinated by the poison ivy plant and just how insidious it can be. We have evaluated and eradicated poison ivy from THOUSANDS of properties, and each one was unique. Every poison ivy problem is different, therefore experience is a huge factor in the success of your poison ivy remediation. We have that experience and more. One poison ivy plant can reproduce thousands of new plants every year. Once a plant matures, it can produce tens of thousands of berries with seeds inside every single year. Birds and small animals love to eat the berries produced by poison ivy, and therefore spread poison ivy to every imaginable environment. No outdoor property is safe from the introduction of poison ivy. If you have a lot of birds, squirrels, chipmunks etc on your property, you probably have poison ivy nearby. 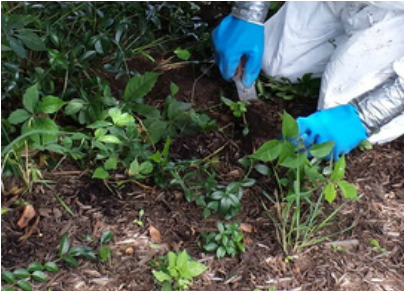 Va Poison Ivy Removal is Virginia's leading hazardous vegetation removal service. We specialize in the hand removal of poison ivy. Hand removal is the ONLY effective method to eliminate the danger of poison ivy from your property. Our expert technicians have years of experience and knowledge to handle any poison ivy problem you have. Poison ivy can establish itself in almost any environment, so we have vast experience working on residential, commercial, industrial and public properties. Hand removal of poison ivy requires knowledge, experience, and lots of attention to detail. Attention to detail is one of our top priorities, and will be evident as soon as we come to your property for a quote. An expert technician will walk your property with you and explain in detail where you have poison ivy, where it came from, and how we will eliminate the danger for good. We will also discuss how pets and outdoor toys can greatly increase the threat of you getting poison ivy. Why hand removal? Isn't spraying it cheaper? Spraying herbicide to try and eliminate poison ivy actually makes the problem more dangerous for you and your family. The poisonous urushiol oil within poison ivy is found throughout the entire plant, from root to leaf tip. When poison ivy is sprayed, the leaves die off, but the stalk is still there. So you are still left with dangerous poison ivy, but no way to easily identify it. And you still get the rash. Even in winter, even years after it has died. It is a very hearty and resilient plant that requires expert attention. It only takes one bout with poison ivy to realize the value of having it removed - from lost wages, to doctor visit copays, missed school, etc. Free property evaluation within Montgomery County. Hand removal and prevention of established poison ivy, oak, and sumac. Hand removal and prevention of established Kudzu. Hand removal and prevention of any nuisance vegetation you want eliminated. Nominal charge for evaluations outside of Montgomery Co, but that charge will be applied to any service purchased.